Tiger stripes on your home’s gutters are less than attractive. When choosing the decor of your home, strategically-placed striped patterns can be very attractive. Incorporating stripes into your wallpaper, curtains, or bed linens can provide a nice accent to a room. Even a striped retractable awning can beautify your home’s exterior while providing much needed shade in the summer. But the one place you do not want to see stripes is on your home’s gutters. 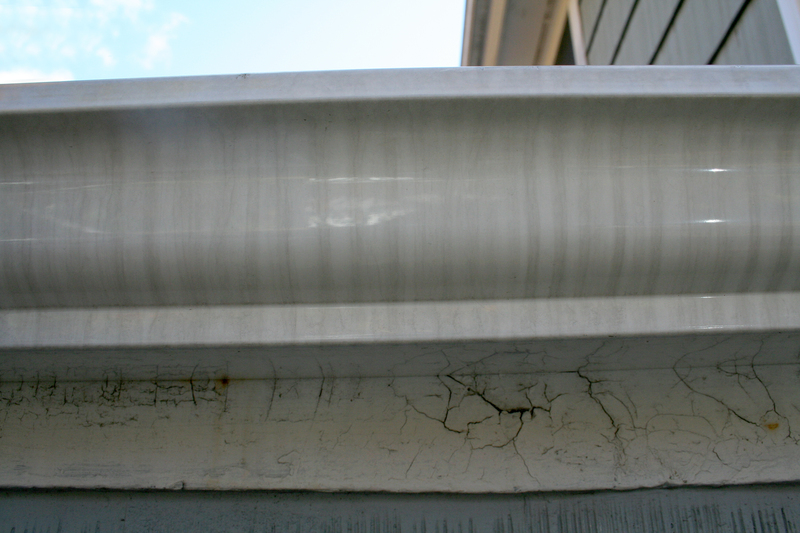 These dark, vertical streaks which are commonly found on the outsides of gutters are known as tiger stripes. And unlike some dirty areas of your home which are not too noticeable, tiger stripes tend to draw the eye toward the problem because they usually contrast sharply with the dark shingled roof and lighter-colored siding. Contrary to what some people believe, tiger stripes are not formed as the result of a failure of the paint or coating on gutters themselves. Rather, they are a consequence of the buildup of dirt, grime, and pollution on the top lip of the gutter. When this substance gets wet, it tends to trickle down the outside of the gutter section. Over time, rain can exacerbate the accumulation of oxides by forming the long, ugly streaks that cannot easily be washed off by precipitation or even the help of a garden hose. Tiger stripes are more problematic in some areas than others depending on the amount of tree sap, insecticide, chimney fumes, or industrial pollution in a given location. To get rid of tiger stripes and prevent them from building up again, you should clean the outsides of your gutters at least once annually. Many people simply perform this chore whenever they scoop out debris from inside their gutters two or three times a year. When cleaning tiger stripes off your gutters, use a non-abrasive household detergent cleaner. There are also numerous products available at home improvement and hardware stores which are specifically designed to clean gutters. Some of the brand names include Gutter Magic No. 9, Gutter Brite, Streak Getter, Krud Kutter, and Gutter Zap Cleaner. It’s possible that you might encounter tiger stripes which are comprised of tougher stains. In this case, use a heavy duty cleaning product such as SC Johnson Fantastik All Purpose Cleaner. If you haven’t addressed your tiger stripes in quite some time, it may be necessary to repeat the cleaning process over some length of time. In some climates, the tiger stripes may be partially comprised of mildew. If this is the case, you can create a cleaning solution made up of one part laundry detergent, two parts trisodium phosphate, 12 parts Clorox Ultra Bleach, and 36 parts water. Just be sure to wear gloves, eye protection, and suitable clothing when preparing this solution and be sure to rinse your gutters thoroughly after cleaning. No matter how pesky the tiger stripes may be, it is not recommended that you use a cleaner that consists of solvents, ammonia, paint removers, or abrasive particles. These substances can remove or soften the finish on aluminum gutters. You should also refrain from cleaning your gutters with a hard or metal brush. A soft brush, rag, or cloth is all that is needed, and be wary of too much vigorous rubbing lest glossy areas be created over the satin finish. A wand or other extension may be used to wipe your gutters from the ground (and don’t forget to check the inside edge for tiger stripes, too! ); but if you want to use a ladder, take extreme caution to stabilize it and not lean too far away from the base trying to reach a spot on your gutters. As a homeowner, you work hard to keep the outside of your home in tiptop shape. So there’s no reason to let unsightly tiger stripes tarnish the appearance and curb appeal of your residence.